In recent years, it has become clear that a major transformation must take place in order to secure our energy future. Damage wrought by carbon and other greenhouse gas (GHG) emissions is causing the earth to warm, destabilizing the global climate. The possible extent of this damage is yet unknown, but scientists predict it could be catastrophic. At the same time, our supplies of oil are dwindling. The fuel that powers our entire transportation system, without which society as we know it would crumble, is simply drying up. We’re consuming it too fast, and conservation alone won’t be enough to save civilization. It’s obvious that the future will look very different from today. If we are to survive without sacrificing our way of life, the world must be transformed, starting with its power source. There are many ways to obtain energy. Sources like coal and oil are considered “dirty.” They emit a large quantity of GHGs and other harmful chemicals like sulfur dioxide when burned. Natural gas and nuclear power are considered “clean” sources since they emit much fewer GHGs, but they are not renewable resources. Though nuclear and natural gas energy will play a role in the future, the revolution needed will be both clean and renewable. Eventually, we will deplete our natural gas reserves, but wind, hydro-electric, and solar energy cannot be exhausted. As long as there is an earth to live on, there will be sun, wind, and water. These energy sources use a lot of land, but if even 1% of the acreage currently being used for agricultural purposes was instead used for solar farms, we could meet the entire world’s energy needs. And some methods of generating renewable power, like tidal collectors and wave farms, don’t use any land at all. One thing is certain: The future of our civilization will be green, but what might that look like? Today, a consortium of oil-rich nations known as OPEC controls the vast majority of the world’s energy capital. Though the U.S. and China are rich in coal and Russia lays claim to some of the world’s largest natural gas fields, these energy sources pale in comparison to the importance of oil, for now. But, the transition to clean energy has already begun. Right now, countries all over the world are locked in a struggle to become true clean energy superpowers. The European Union is leading the way, but America and China are on their heels. In the year 2060, there will most likely be three clean energy superpowers. For decades, America has had a love/hate relationship with energy. The U.S. consumes more of it than any other country, imports more oil than any other country by far at 9.6 million barrels per day, and we still depend on coal-fired power plants and large-scale mining operations like environmentally devastating mountain-top removal operations. The U.S. government gives away billions of dollars each year to the oil industry to keep cheap fuel flowing, and many politicians are content with the status quo, denying the science of global climate change. Yet, slowly but surely, things are changing. Despite its love affair with oil, America has always been known for innovation and creativity. With its large, well-educated population and entrepreneurial spirit, the U.S. is well positioned to take the lead in clean energy. Of special note is the Recovery Act of 2009, which set aside $80 billion in funds for wind, solar, and hydro-electric power. This alone will double America’s generation of clean energy in only three years. With its obvious benefits to the environment and the economy, renewable resource research and implementation is one of the only items on the congressional agenda that both Democrats and Republicans can agree is important, so expect more strides in the future. In President Obama’s 2011 State of the Union Address, he called the energy crisis our generation’s “Sputnik moment,” and called for open competition with China and other nations to “out-innovate, out-educate and out-build” the rest of the world. He also pledged to make America the first country to put a million electric vehicles on the road. There’s little doubt that the president was striving at the time to make the U.S. a green superpower. In many ways, the U.S. and China couldn’t be more different, but when it comes to energy, China is America’s younger and more ambitious sibling. China is the second-largest consumer of oil at 4.3 million barrels a day, and together the U.S. and China make up 60% of the world’s coal consumption. Many of the world’s dirtiest power plants reside in China, where the need for cheap, fast energy is only accelerating. If their billion-plus strong population begins consuming at the rate Europe and America do – adding more gas-powered cars to the road and upping their electricity consumption to that of developed countries – there simply would not be enough resources to go around. The Chinese know this, and although they continue to consume oil and coal, building more coal-fired plants each year, they’re also a growing clean-energy innovator. Eager to take their rightful place as a clean energy superpower and claim a big part of the forecast $5.7 trillion green energy market, China is working with the U.S. to usher in a new green age. Energy-efficient means of travel, like high-speed rail and electric cars, and intelligently designed cities with LEED-certified “green-scrapers,” will lessen their environmental impact as the country grows ever more urban and less agrarian. Meanwhile, China has become the home of the world’s largest solar facilities, which will supply energy to three million homes when it is completed in 2019, and they have pledged to reduce their carbon emissions by 40% to 45% by 2020. With a large, industrious workforce and a keen eye for opportunity, China will certainly be at the forefront of clean energy. The E.U. is already a clean energy superpower of sorts, leading the world in renewable resource production. Setting their sights on 2050, the European “Roadmap” to a green energy future has laid out a lofty goal: reducing carbon emissions by 80%. This is only possible if all available technology is put to use. Nuclear power and carbon capture and storage technology will play a part in the reduction, but some countries are already investing heavily in re-newables. Iceland is well known for using its abundant geothermal heat sources to generate electricity and heat homes. Other Scandinavian countries, including Sweden, Denmark, and Finland, are also making use of re-newables, most notably hydro-power and wind. However, if the E.U. wants to reach its 80% target, it will have to be a team effort, focusing on Scandinavia’s increased wind power in the winter, and Spain’s and the Mediterranean’s increased solar capacity in the summer. Hot fusion plants, with two planned in the U.K. and France, could fill in the gaps. Europe, the U.S., and China are already moving to pass legislation that moves us toward that goal. Will the rest of the world follow? Experts have long debated the best methods of generating power. Each technology has its own strengths and weaknesses, each impacts the environment differently, and each has its own set of economic costs. In recent years, it’s become clear that a mixture of different green energy technologies is the only way to make an immediate, lasting impact. Here are a few examples of technologies that will help take us into a green future. Solar power – energy harvested from the sun’s rays – is one of the most abundant sources of power on the planet. Every day, the earth is bombarded with solar energy, enough to power all of the world’s ecosystems and its entire weather system with plenty left over for tanning beach-goers to a golden bronze. There are several methods of capturing this energy, with passive solar (i.e., just letting it naturally warm up a building by letting in and storing heat) and photovoltaic (i.e., electricity-producing solar panels) being the main two. We are investing billions in solar research, but we’ll have to invest a lot more if we want to power the planet with it. There are certain challenges to overcome when it comes to wind farms. Although we’ve been turning wind into mechanical energy for generations through wind mills, generating enough electricity to power the world’s homes is on a whole different level. Placement of wind farms is key, ensuring they are in areas that are windy enough to provide consistent power. When the seasons change, the amount of wind available changes, too, and this must also be taken into account. One strategy for overcoming this restriction is a new form of a flying wind farm. In this scenario, the windmills float on lighter-than-air crafts like balloons high in the atmosphere where wind is constant, and then the energy is sent to power plants on the earth’s surface through their electricity-conducting tethers. Today, more wind energy is generated in Scandinavian countries than anywhere else in the world. Hydro-electric plants have been generating electricity all throughout the 20th century and up to today. Some famous examples include the Niagara Falls plant and the Hoover Dam in the U.S. and the Three Gorges Dam in China. The power of rushing water turns turbines, which generate electricity. This carbon-neutral renewable resource powers millions of homes around the world, but it’s not without its own environmental hazards. The plants can disrupt wildlife and significantly impact entire ecosystems. Untold energy is contained in the world’s oceans. The constant motion of the water day in and day out transfers a staggering amount of power from place to place, and current systems like the jet stream provide constant movement on an enormous scale. The power is undeniable – enough to meet 40% of the world’s power needs – but harvesting it is a challenge. 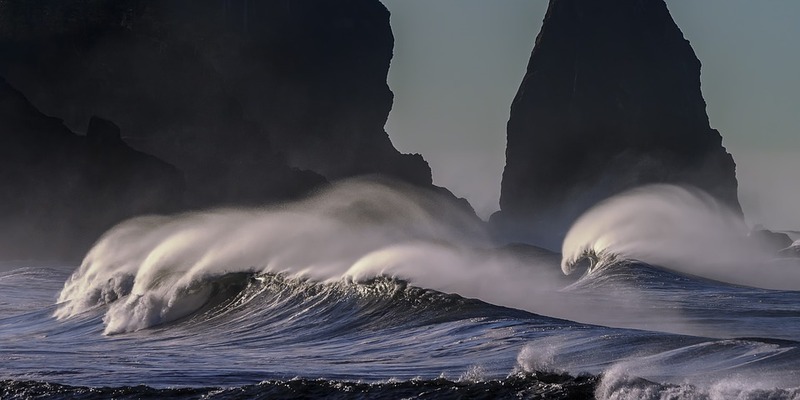 Like wave power, tidal power also depends on the motion of the ocean, but instead of relying on the constant motion of waves, it instead harnesses the larger and more reliable force of the changing tides. Examples of this technology have been in operation since 1966, but more advanced technology can be used in more places and is even more efficient. Fusion power is somewhat more bombastic than other renewable resources. It is, simply put, the power of a star unleashed on earth. Unlike traditional nuclear power, which takes a very heavy element like plutonium and splits the nucleus in half, a fusion reactor harnesses the energy of special hydrogen atoms, called deuterium, fused together to create helium. Not only does this produce far more power than fission, it also produces no toxic nuclear waste. The only byproduct is helium gas. As simple as this sounds, pulling it off will require some of the most complex facilities ever constructed. Fusion power is still about 10 years away, but plans exist to build fusion plants in France and the U.K. as well as an R&D facility in Japan. Of note is the differentiation between a fusion reaction and so-called “cold fusion,” a pseudo-scientific fantasy wherein limitless energy is derived from a simple jar of air and water. Many have claimed the discovery of cold fusion in the past, but no one has produced hard evidence that such a thing is possible. In reality, any viable fusion reaction will be “hot,” that is, as hot as the sun or a hydrogen bomb explosion, and will need to be contained within complex facilities using technology only barely within our reach. However, the rewards of such a process are well worth the effort, and by 2050, fusion reactors could be powering homes across the world. So what will the world look like in 2060? Hopefully, those of us still around can look forward to clean air and a stable world climate, thanks to greatly reduced greenhouse gas emissions. Our homes will be powered by inexhaustible resources like solar, wind, and hydro-electric power. The global political climate will be more stable as well: Instead of the world’s superpowers struggling to maintain control of key oil fields and natural gas pipelines, energy needs will be met domestically. And, with the promise of fusion power, people all over the world will have ample energy to run their homes, schools, and hospitals; to purify water; to provide energy to agricultural efforts; and to keep their cities running night and day. Urban centers will grow upward as well as outward – thanks to green buildings and clean, quiet electric cars – and fast, reliable public transportation will take us anywhere we need to go. But we’ll only get there through a true team effort, world-wide innovation, and decisive global government action taken for the greater good. This is an article from WellHome, which provides Energy Audits and home Assessments. They offer you the ability to upgrade HVAC, Windows, and Home Insulation and can also perform Duct Tightening and Air Sealing to allow for a more comfortable and well balanced home. WellHome Home Energy Assessments allow the homeowner see the bigger picture of home efficiency and its ability to maintain comfortable temperatures and air flow.